If you’ve been following OKC.NET for awhile, you know we have soft spot for psychedelic art and music. Around this time last year, I was just getting back from Austin Psych Fest. I’d posted some pictures on Instagram of the event, and noticed an Instagram user with the handle Spiral Drift had liked one of the photos I posted. I can’t tell you what it was that made me click on her profile, but I did. And what I discovered was a wonderful world of leather creations unlike anything I had previously seen at various indie craft fairs in Oklahoma. Naturally I ended up following Spiral Drift’s a.k.a. Christina Garcias’ Instagram and pretty much I have spent the last year ogling her work, wondering if I could get away with wearing any number of her accessories and jewelery. Fast forward to now. I was happy to see Christina announce that she’d be vending at Austin Psych Fest this year. So of course I had to interview her. Some readers might recognize her work from Shop Good, DNA Galleries, or seeing her at the Plaza District Festival last year. If you can’t make it Austin Psych Fest this year, just know you’ll have the opportunity to check out her newest creations right here in Oklahoma later on in May. Just read on. OKC.NET: When did you get into this kind of work? 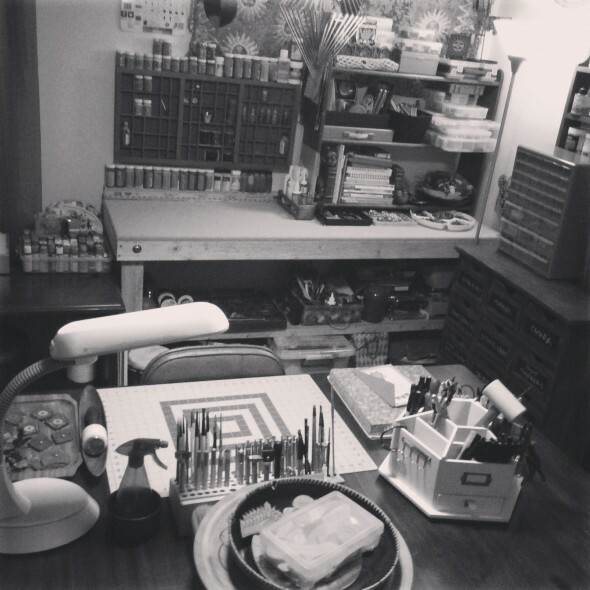 Garcia: I started working with leather around 2008 while living in Montana. I’d attend these annual ‘Mountain Man Rendezvous’ events that introduced people to primitive skills like leatherworking, bow shooting, knife throwing, etc. Everyone would dress in period pieces and hold live demonstrations. I’d buy scrap leather and just make little pouches and other random stuff, it was a really neat experience. OKC.NET: Who and/or what inspired you to create Spiral Drift? Garcia: Spiral Drift came into creation shortly after leaving MT and moving to OK. I’ve always dabbled in different artistic mediums but I think my admiration for Montana, the beautiful landscape, and time I spent there was a big part of why I stuck with leather. It’s the nostalgia that drives me and keeps me going. OKC.NET: What spurs your creativity when it comes to the finished design choices? Garcia: My designs are always emerging, creativity flows from pretty much anything I find interesting or pleasing to look at. I like intricacy, patterns, texture, color, and really unusual and weird styles. I usually don’t have any particular ideas in mind when designing, it just evolves as I go. OKC.NET: How difficult is it to cut leather, paint it, and otherwise make jewelry or accessories with it? Garcia: Leather is an amazing and versatile canvas to work with, the possibilities are endless. Many steps and details are involved in the pieces I create. I start with vegetable tanned leather, basically a blank canvas. 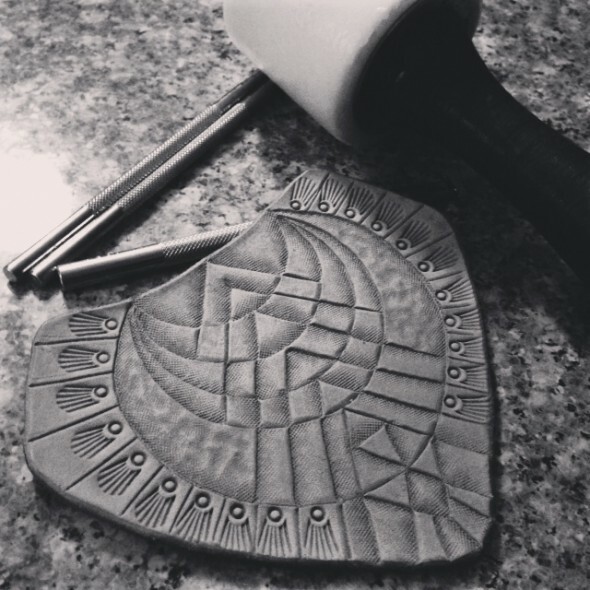 From there I cut the shape and make my designs by either carving or burning into the leather. 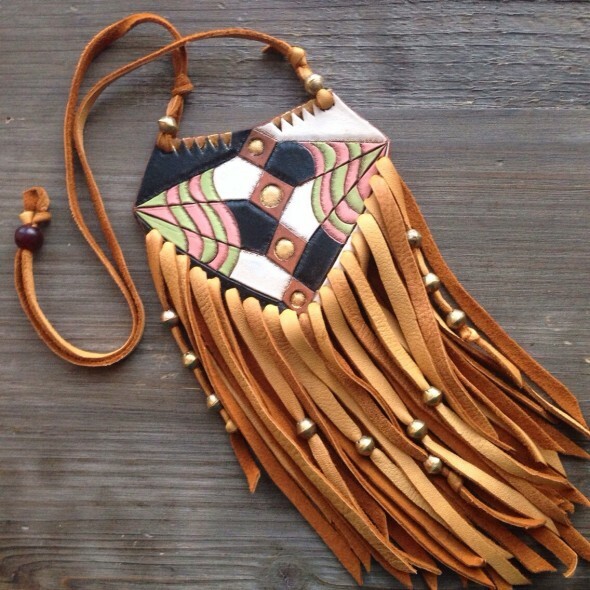 I mix up the styles by tooling (stamping), painting, staining, dyeing, sewing, wire-wrapping, and finishing it off with stones & beads, fringe, and hardware. OKC.NET: Your color combinations are eye catching, how do you see your work strike people who purchase it? Is it love at first sight? Garcia: I’d like to think its love at first site. The colors certainly grab the attention of the viewer. I imagine many people are surprised that it’s jewelry. My stuff has been identified as “statement pieces” and “wearable art,” I consider those to be pretty accurate. OKC.NET: Now for Austin Psych Fest! Is this your first time at the event? If not, how many times have you been? Garcia: This will be my second time attending APF. I went last year with my sister. It was amazing, and happened to be on my birthday weekend! It’ll be a whole new experience vending! OKC.NET: Who have been your favorite bands and were there any moments that particularly stood out for you? Garcia: Black Rebel Motorcycle Club put on an incredible performance. I didn’t think I’d ever get a chance to see Silver Apples or Roky Erickson live, so that was rad. Man or Astroman?, Black Mountain, and Warpaint were amazing…so much good music! OKC.NET: Who are you looking forward to this year? OKC.NET: There are a lot of music festivals that combine with the arts, why did you choose this one specifically or will you be at other music festivals this year too? Garcia: Vending at a music festival is a ton of work. Preparation, cost of booth, travel, getting the help needed are all factors that can be quite exhausting. This is my one big event this year. I chose this festival in particular because it’s the most suited to my taste in music…and it’s Austin! Cool scene and not too far from me. Also, The Reverberation Appreciation Society does a fantastic job choosing artists from all over the globe. Good crowd. OKC.NET: For Oklahomans who won’t be at Austin Psych Fest, where can they find you this year – Plaza District Festival, Indie Trunk Show, etc? Garcia: My next event will be the Indie Trunk Show on May 17th here in OKC. I’ll be slinging my leather with my friend Alex who will be selling her vintage goods (Gaia Guerrilla). Other than that my calendar is clear, I’m going to try to focus on building my inventory and supplying the shops I consign with: DNA Galleries (OKC), Shop Good (OKC), and The Art and Found (Ithaca, NY). 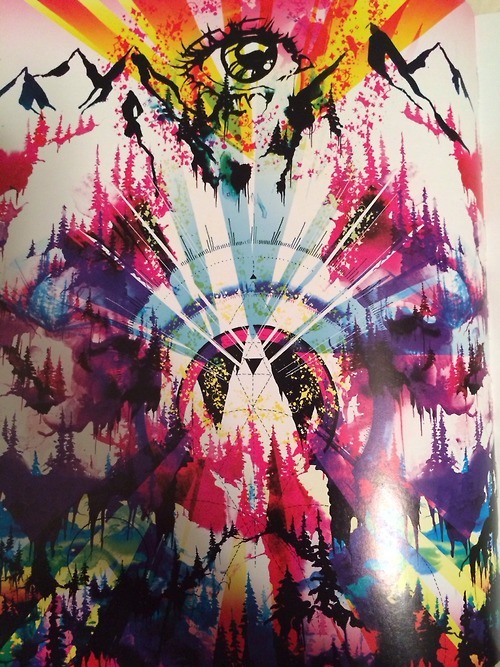 OKC.NET: Just for fun: Have you checked out that new Psychedelic art book from Juxtapoz? Garcia: I haven’t gotten my hands on Juxtapoz’s Psychedelic Book yet, but I’ve been lusting for it! That’s the only magazine I subscribe to in fact. I wish I could be in LA for the Book Release and Exhibition on April 26th! My birthday! Thanks for reminding me to order my copy! I pre-ordered mine. Here’s the first page: “We are now seeing a resurgence of psychedelia in the visual culture that reflects an era of radical thought and revolutionary action. Perhaps this psychedelia comes from a sense of nostalgia for a once rebellious and idealistic time, or perhaps it is a direct desire to reincorporate its principles into our own lives. No matter the case, freedom through escapism and personal development by expansion of the creative mind is available to all, and to all a good flight.” – 2013, LA, Hannah Stouffer (artistic image credit goes to her too). OKC.NET: Are there any current or past psychedelic visual artists that you find yourself circulating back to for inspiration? Garcia: Oliver Hibert’s work is killer, so bright and psychedelic. Elena Stonaker is always impressing me with her unique style. Jetter Green and Kelsey Brookes are an inspiration. 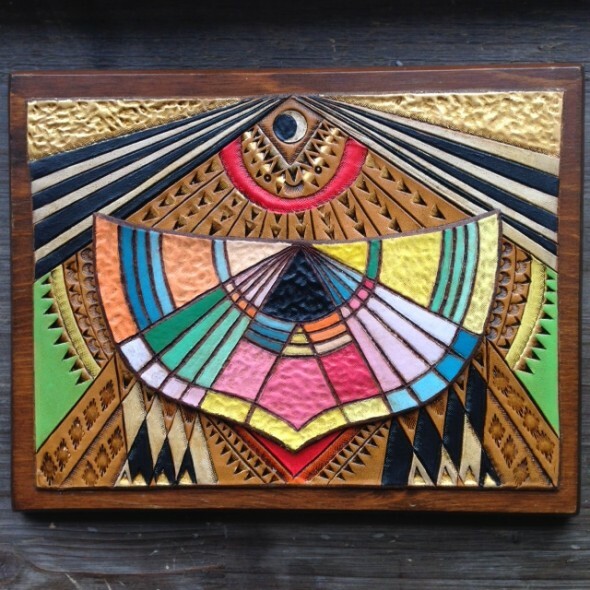 Of course you can’t talk about psychedelic art without including Alex & Allyson Grey. OKC.NET: Do you have any favorite music or art outside the Psychedelic genre that’s got your ear or caught your eye recently? Garcia: I’ll always have a place in my heart for street art, it was a big part of my formative years. That and underground hip hop (mainly the Anticon artists and collaborators). I always find myself reverting back to that music. My music style is so vast and hugely mood based. I can jump from Hank Williams to Elliott Smith to Violent Femmes. As far as new music goes, I haven’t really been keeping up! OKC.NET: If you planned on going to Norman Music Festival, who was on your “Must See List”? Garcia: Hopefully I get to make it down to the NMF this year, if only for one of the days at least. I’d like to see and show some support for some of my friend’s bands: The Gentle Art of Floating, Wurly Birds, Feathered Rabbit, Them Hounds, Colin Nance, and of course Dead Meadow any chance that I can get! Tagged Alex & Allyson Grey, ART ✍, Artist Profile, Austin Psych Fest, Avey Tare's Slasher Flicks, bands, Black Mountain, Black Rebel Motorcycle Club, Colin Nance, Dead Meadow, Elena Stonaker, Feathered Rabbit, Indie Trunk Show, Jetter Green, Juxtapoz, Kelsey Brookes, Leather, Man or Astroman?, music, Norman Music Festival 7, oklahoma, Oliver Hibert, Panda Bear, Psychedelic, Roky Erickson, Silver Apples, Spiral Drift, The Brian Jonestown Massacre, The Dandy Warhols, The Gentle Art of Floating, The Horrors, The Zombies, Them Hounds, Warpaint, Wurly Birds. Bookmark the permalink.